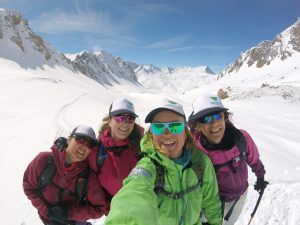 For the third year running I have just finished leading the FREEFLO Womens Introduction to ski touring Course in Tignes and Val D’Isere. I love and enjoy running this two day adventure as it allows me to pass on skills and twenty years of winter mountain experience to people that have never experienced ski touring in the backcountry before. I have just had an amazing time with four special people. To gauge ski ability and to brush on technique before heading into the backcountry we skied a small section of off piste . The snow was great and as soon as the clouds broke and the blue skies arrived I took the opportunity and lead the group into the wilderness of the backcountry. Virgin untracked snow as far as the eye could see was our view as we crossed the Col De Palet. No one was around as skiers were skiing fresh powder in the resort. It was perfect timing as we made our own tracks in the powder as a group of five. Once we had arrived at the lake we tucked into a well deserved snack and drink. After ski touring for fifty five minutes we then arrive to the refuge de palet and enjoyed tucking into a three course meal. The next morning was clear and no one was in sight. 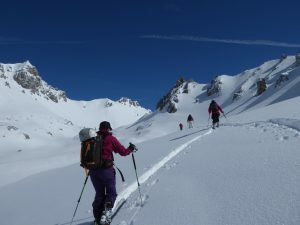 We took full advantage and skied the powder on the north facing slopes to lake Grattalu and then broke tracks uphill making our way through the valley of La Tourne. 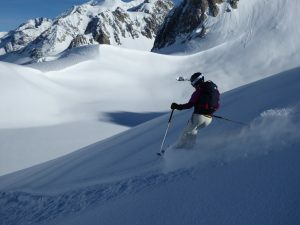 The valley La Tourne is one of my favourite ski touring itineraries. Its gentle and has breathtaking views especially when come out of the Col de Tourne and overlooking Tignes. It was an amazing two day adventure with great company and one that I will never forget. 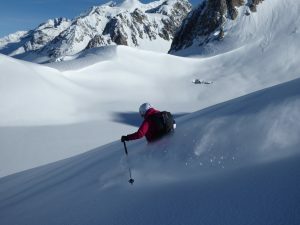 FREEFLO specialises in progressive on and off piste ski instruction, backcountry ski touring and women specific ski courses. 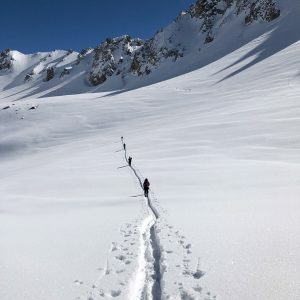 We offer personal British ski lessons for skiers of all abilities, though our sweet spot is helping competent skiers to improve their technique on and off piste and in the backcountry. Our intuitive coach-approach will help you to progress, have fun and enjoy the full freedom of the mountains in a safe and confident manner.